United States Stamp Society, USSS member since 1983; etc. OF FOUR IS SOLD FOR NEARLY $5 MILLION! Donald Sundman's Mystic Stamp Co. of Camden, NY revealed that his prize possession, the one-of-a-kind 1918 Jenny Invert Plate Number Block of Four, was sold on 10/7/14 for, as Sundman said, 'north of $4.8 million.' The once-anonymous buyer is revealed to be Stuart Weitzman, world-famous celebrity shoe designer and stamp collector. The normal 1918 24¢ airmail stamps (Scott Cat. 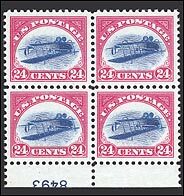 #C3) and the 24¢ Jenny inverted stamps (#C3a) -- the most famous stamp errors in the world -- are named for the Curtiss JN-4 'Jenny' biplane, an early barnstorming two-winged 'aeroplane' featured in detail in the first American airmail stamp's blue center, or 'vignette.' Speculation abounded for which mysterious gal the 'Jenny' plane was named. Alas, my research reveals a less romantic explanation: the 'JN-4' painted on each of the 6,813 biplanes built 1915 to 1919 -- which were a key American military factor in helping to win World War One -- used an open top '4' which looked like a 'Y' – and the catchy 'Jenny' nickname stuck. The Jenny Invert Plate Block's fascinating price history begins in 1918. William T. Robey 'struck lightning' purchasing the full sheet of 100 inverts at the Washington D.C. New York Ave. post office for face value, $24. Defying postal inspector threats, he sold it six days later for $15,000 to renowned Philadelphia stamp dealer Eugene Klein -- who had already pre-sold the sheet for $20,000 to Colonel Edward H. R. Green, one of America's wealthiest investors, son of ruthless, miserly Hetty Green, notorious 'Witch of Wall Street.' Hetty had died two years earlier, in 1916, leaving her son a $100 million fortune, after years of her guilt because he lost a leg as a boy when she refused to pay the doctor. Two Jenny invert singles from William T. Robey's original discovery sheet of 100 have been lost since 1918 and are complete mysteries. Over the decades, some were stolen, a few were unsuccessfully altered, and all have since been identified and found except for one still not recovered, making a grand total of three missing Jenny invert singles. 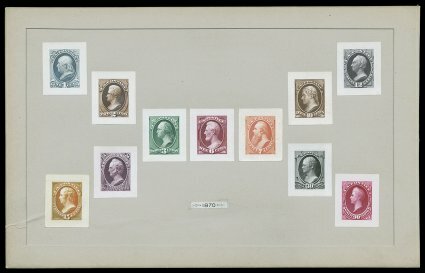 Apart from the 2014 sale of the unique Jenny invert plate block for $4.85 million, each of the other five surviving Jenny invert blocks is uniquely special -- center line block, left margin block with arrow, lower left corner margin block with the siderographer's (printer's) initials. None of the five other blocks have changed hands since 2002. When sold, those other five blocks -- each with a colorful story -- could easily realize several million dollars each. Unused Jenny Invert singles brought $126,500 to $1.31 million each -- prices affected by condition. Two choice singles in 2014 fetched $575,000 each at auction. In December 2007, two exceptional Jenny invert examples had both sold, just weeks apart, for $935,000 and $977,500 respectively -- with that record to be toppled nearly a decade later, on May 31, 2016, by an almost superb gem -- the highest quality Jenny invert yet graded, at 95 (of 100) -- which achieved the stunning new record of $1.31 million at auction; and sold to an anonymous buyer. Green's estate auctioned his vast holdings in 1942 including his remaining Jenny inverts. After the plate number block of eight was divided, in 1953 the unique upside-down Jenny Plate Number Block of Four fetched $18,250. It sold in 1980 for $1.1 million (to rumored Ted Turner?). 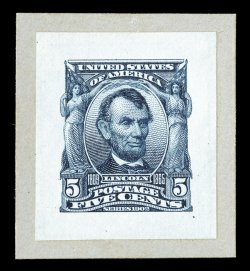 In 2005, it sold for $2.97 million to billionaire Bill Gross, who traded the unique Jenny Invert Plate Block two weeks later to Mystic Stamp Company. In that world-famous swap Gross got the 1868 1¢ Franklin 'Z Grill' (two known) which completed his award-winning 19th century U.S. collection -- first time anyone owned every issued full-number 19th century U.S. stamp -- including the one-of-a-kind 24¢ purple 1875 Lost Continental -- America's only unique and rarest United States stamp (see exciting story in Jay Tell's bio) -- an historic find. With this sale for nearly $5 million, the Jenny Invert Plate Number Block remains the world record-holder for any U.S. philatelic 'item' (multiple or single stamp). Jenny is second to the British Guiana 1856 1¢ magenta 'crème de la crème' which Sotheby's sold in 2014 for $9.5 million, more than four times the prior 1996 single stamp record of $2.2 million. Using $4.85 million as the price, compared to its $18,250 first auction realization in 1953, the stunning singular masterpiece Jenny Invert 'one-of-a-kind' Plate Number Block of Four appreciated an astonishing 26,575% in 61 years. Aviation was new when the first airmail stamp was rush-printed for issue on May 13, 1918 -- as World War One was still blazing. Philatelists including Robey were aware that inverts were possible since two-color U.S. stamps issued in 1869 and 1901 had produced a few world-famous inverted errors. In that era, stamp sheets with two or more colors were hand-fed into the press -- once for each color -- creating the possibility of a printer error on one or more sheets. Robey, 29, had predicted to his wife and a friend that he was 'looking for' and 'might find' an inverted sheet of the new airmail bi-colored stamp. On that fateful day, May 14, 1918, Robey, a junior bank cashier, withdrew $30 from his account -- six weeks of his $5-a-week wages -- with that specific miracle possibility in mind. When the post office employee took $24 and handed him the sheet of 100 Jenny inverts, Robey said, 'My heart stood still.' The rest is history. SOLD AT SOTHEBY'S FOR $9.5 MILLION! 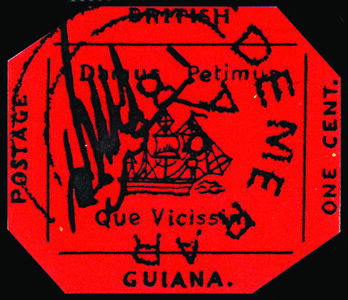 The world's most valuable stamp, the unique 1856 British Guiana 1¢ magenta -- the 'Holy Grail of Stamps' -- the 'Mona Lisa of Philately' -- was sold June 17, 2014 by Sotheby's (established 1744) in New York after viewings for prospective bidders in London, Hong Kong -- and achieved the single stamp world-record auction price of $9.5 million dollars -- shattering by 430% the prior record for a single stamp of $2.2 million set in 1996 by a Swedish 1855 error of color stamp. This incomparable icon of the stamp world was discovered in an attic by a 12-year old school boy -- and sold for $1.50 in 1873, $750 in 1878, $36,000 in 1922, $45,000 in 1940, $280,000 in 1970, $935,000 in 1980 to philanthropist John E. du Pont (1938-2010), heir to a fortune, who died in prison for the second-degree murder (diminished capacity) of his wrestling partner, Olympic Gold Medalist Dave Schultz -- subject of the 2014 critically acclaimed Steve Carell film, Foxcatcher. This 'stuff of dreams' set its fourth consecutive single-stamp world-record auction price since 1922, realizing more than ten times its $935,000 price from 1980. This sea-change auction event (the first time the legendary prize was offered in 34 years) earned unprecedented media coverage attracting major art collectors, real estate tycoons, stock and bond investors. This worldwide publicity increases interest in, and demand for, all rare stamps. With today's instant news (PC, lap top, tablet, iPad, smart phone, Twitter, etc. ), within hours hundreds of millions around the world knew of this historic sale. Since 1878, this timeless treasure's exquisite mystique, allure, romance, excitement and value has grown with each new generation. In 1856, with his stamp shipment delayed, the British Guiana postmaster ran out. He asked a local newspaper publisher to quickly design and print temporary stamps, which philatelists call 'postmaster provisionals'. He was unhappy with the simple design. To make it difficult for forgers, he had a postal employee sign his initials on every stamp before it was sold. The 1¢ rate was often used on newspaper wrappers, which upon receipt were then typically discarded -- but this lone example survived. It was discovered 17 years later by L. Vernon Vaughn, a sharp-eyed 12-year-old lad, a stamp collector, while rummaging through in his parents' attic -- to the sheer delight of countless generations of philatelists, historians, and wordsmiths. At just 1 / 300th of an ounce -- only 1" x 1.25" in size -- it is 'the most valuable object on earth for its size and weight.' This tiny but powerful 'solitary grandeur' -- since 1878 'the locomotive of the stamp world' -- was owned by Count Philippe la Renotiere von Ferrary who amassed the world's greatest stamp collection -- which was seized in 1918 by France for WW1 German war reparations -- and sold in 14 landmark auctions from 1920 to 1925. In 1922, King George V, the under-bidder at the auction, shocked everyone by failing to buy this 'creme de la creme' -- and today it is the only British rarity missing from the fabulous 2,500-album Royal Heirloom Philatelic Collection -- begun in 1856 by Queen Victoria's son, Prince Alfred. Rumors abounded as to the identity of the $9.5 million dollar mystery buyer, an anonymous telephone bidder. Perhaps billionaire Bill Gross? His holdings reportedly top $100 million in value. Or Warren Buffett, Sheldon Adelson, Bill Gates? Larry Ellison, Ted Turner, Steve Wynn? Perhaps the buyer was Great Britain's Royal Family? That would correct the blunder of King George V who allowed the stamp to sell in 1922 for 'only' $36,000 to shrewd American textile mogul Arthur Hind. Alas, it has been revealed the $9.5 million buyer is Stuart Weitzman, world-famous celebrity shoe designer, who loaned the 1856 stamp icon to Smithsonian National Postal Museum to exhibit the treasure at World Stamp Expo NY in 2016. Special Note: This is not just a stunning event in stampdom; to me it is quite personal. In the early 1950's, since age seven or eight, I marveled at stories in The New York Times, Reader's Digest, Life, Look, Time, Newsweek and Coronet about the famous 1¢ British Guiana stamp having graced world-renowned collections. Back then, the world's largest, most famous stamp dealer, Henry Ellis Harris of Boston, estimated its worth at 'the grand sum of $50,000.' My childhood memories are not unique -- since its discovery in 1873 millions of all ages have swooned over this magical, mystical masterpiece -- which is ingrained in our culture, our heritage -- whether or not you are a stamp collector. It was profoundly humbling to me as a youth, as it is today, to know that no other stamp -- that I or anyone else will own -- will ever equal its stature, majesty or value. (2) The 1985 Mark Twain Halley's Comet 36c Aerogramme Sheet -- UNIQUE fold-over and wild miscut shows plate number, supposed to be trimmed off -- Since the 1920s only nine aerogrammes have been discovered with plate numbers -- each one unique to that issue -- Only $17k -- the only one in the world -- simply gorgeous -- it can only happen with a fold-over, nearly impossible with high speed rotary press and giant rolls of paper -- guaranteed to get Philatelic Foundation Certificate of 100% authenticity. Package deal, $19.5k + $17k = $36.5k or both for $33k to the first to win these prizes! >> These are world-class heirlooms -- remarkable acquisitions -- cannot be duplicated for ANY price -- perfect for your retirement or to secure your children's future. Jay has 60 years experience as a rare stamp and rare coin dealer, uniting treasures with serious collectors and savvy investors since 1958. Backed by a lifetime of expertise, he is a skilled buyer and appraiser, court-certified expert witness, confidential consultant, trusted agent -- and a lifelong specialist in U.S. and world stamp and coin classics, rarities, errors, inverted centers, etc. Jay handles all kinds of other collectibles as well -- currency, presidential and historical documents, rare autographs, film and sports memorabilia, antiques, old photos and books, vintage jewelry, gold and silver. Born in North Bergen, New Jersey in 1944, Jay is a former newspaper editor, publisher, investigative reporter, columnist -- and is a lifelong polished writer. Jay is The History Channel's PAWN STARS stamp, coin and currency expert. Pawn Stars is a top weekly reality show on cable and satellite TV -- with tens of millions of loyal viewers from coast to coast -- and is syndicated in scores of countries. The famous Las Vegas pawn shop buys and sells all kinds of collectibles and has become a tourist attraction. Jay's Pawn Stars TV shows are quite popular, and are often re-run on The History Channel. Jay began his long lasting love-affair with stamps and coins as a boy, and had his first show booth in 1958, at 14, shared with a friend -- the late Marvin Frey, a lifelong dealer -- at the very first New York Interpex Stamp Expo. As a teenager, Jay visited old masters on legendary Nassau Street (hundreds of dealers in a few blocks; perhaps 50 in one building -- the famous 116 Nassau Street) for his specialty, misprints. An emerging entrepreneur, Jay pioneered the tiny error field which he helped grow to never-imagined popularity. Jay became trusted by older dealers who taught him -- 'Your word is your bond' -- 'High ethics are moral and good business' -- 'You are not just selling stamps and coins, you are selling knowledge' -- 'Everything a dealer buys should be for sale - don't compete with your collector and investor clients.' In the 1960s, rents soared on fabled Nassau Street (adjacent Wall Street) so dealers were forced to move, ending the hobby's Golden Age -- the final years Jay treasures as lasting inspiration and lifelong positive influences. Jay owned and operated five Los Angeles retail stamp and coin stores from the 1960's to the 1990's starting in 1965 at age 21. He handled 100,000+ career transactions for millions of dollars in store sales, floor auctions, mail sales, trade shows, internet, direct mail; with zero complaints in his years as a licensed, bonded California stamp and coin auctioneer. In 1975, at 31, Jay was the first dealer in history to buy and sell a coveted Nobel Prize, the 23k gold medal awarded in 1956 to Sir Cyril Hinshelwood for Chemistry, for pioneering cell research that led to the miracle of antibiotics. The Prize had been rejected by the oldest and largest auction houses (Sotheby's, Spink, Christie's), as it had no price history prior to Jay's historic purchase and sale. It was believed the only Nobel heirloom to leave a recipient's family since the first in 1901 until 1985 when Sir William Randal Cremer's 1903 Nobel Peace Prize, for international arbitration to avoid wars, sold for $16,750. In 2012, Aage Niels Bohr's 1975 Nobel for Physics, for the particle theory of atomic structure, sold for about $50,000. His dad, Niels Bohr, had won a Nobel in 1922. Only six times have a father and son won Nobel medals. The elder Bohr was on the top-secret Manhattan Project to develop the first nuclear weapons, which shortened WW2 and saved millions of lives. >> The nearly $50,000 auction price was smashed in 2013 when the 1962 Nobel medal awarded to Francis Crick, co-discoverer with Dr. James Watson in 1953 of double-helix DNA, sold for an amazing $2.27 million. >> In 2014, Argentinian Carlos Saavedra Lamas' 1936 Nobel Peace Prize -- the first ever to a Latin American -- sold for $1.116 million. It was lost but later surfaced in a pawn shop. Lamas led the League of Nations, predecessor of the United Nations. >> Sir James Chadwick's 1935 Nobel medal for Physics, for discovery of the neutron, sold in 2014 for $329,000. >> Dr. James Watson's 1962 Nobel, as co-discoverer of DNA with Crick, sold in 2014 for a stunning $4.76 million to Russian billionaire Alisher Usmanov, who generously returned the Nobel to Watson, who gave the money to gene research labs. >> Simon Kuznets' 1971 Nobel Prize in Economics, for 'Kuznets Curve' measuring income inequality, sold in 2015, $390,848. >> Heinrich Wieland's 1927 Nobel medal for Chemistry sold in 2015 for $395,000 for research of cholesterol, bile acids, and pain medications like morphine. Wieland defied the Nazi's by bravely protecting Jewish scientists, and many were saved. >> Dr. Leon Lederman's 1988 Nobel Prize in Physics sold in 2015 for $765,000. In 1962, Lederman discovered the sub-atomic 'muon neutrino' controversially nicknamed the 'God particle,' leading to the 2012 Higgs boson monumental breakthrough at CERN collider near Geneva. Lederman was the second living recipient, after Watson, to sell a Nobel; to pay medical bills. Jay made philatelic history when he bought and sold the only UNIQUE United States full-number stamp, the 1875 24¢ Winfield Scott, Scott #164, printed by the Continental Bank Note Company -- so Jay named it the Lost Continental. The original discoverer, from San Diego, California was unable to sell it for 31 frustrating years (1968-1999); in three decades he had just one cash offer -- only $2,000. The stamp was rejected, ridiculed and belittled by the world's leading stamp dealers and most prominent auction firms who disparaged its legitimacy -- convincing major collectors and world-class investors to 'stay away.' In 1999, Jay was called to see it. When approached by the disheartened owner, Jay soon became convinced the purple adhesive was authentic. He researched its amazing history and launched a major educational, publicity, editorial, promotional and advertising campaign at his own expense. He boldly took on very powerful interests who were determined to protect another stamp, the 1868 1¢ Franklin Z Grill, Scott #85A, which was widely but 'incorrectly' promoted for 30 years as America’s rarest stamp. Yes, it is a great rarity, but there are two known examples of the 1¢ Z Grill, so, if Jay’s #164 -- with only one known to exist -- was validated with a meaningful sale, the famous Z Grill would drop to second place. Quite simply, one extant is rarer than two. Despite millions spent for decades by industry leaders on countless ads, articles, books and catalogs 'erroneously' claiming the Z Grill to be the rarest U.S. stamp -- it was soon to topple off its lofty perch. Legendary philatelic authors were pioneer stamp experts of the late 19th and 20th century (Luff, Ashbrook, Chase, Perry, Brookman). They presumed or surmised that #164 should exist since no 24¢ Winfield Scott had ever been found on ribbed paper which identifies a Continental Bank Note Company printing. It also features a color not seen before, slate bluish purple, and a bold 'six leaf' fancy cancel used during this narrow time period. Additionally, #164 has the 'partially weak plate impression' incredibly predicted in Lester Brookman's 1947 three-volume master work. Undiscovered since 1875, lost to the sands of time until 1968 -- the Lost Continental was not truly acknowledged for 124 years until Jay's landmark 1999 sale. Jay’s ground-breaking research was featured in stories, large ads, and his hard-hitting four-page Tell Tales column (12/17/99) in Mekeel's & Stamps Magazine, America's oldest philatelic weekly, established in 1891. His media blitz openly challenged industry leaders and headlined, 'The famous Z Grill is NOT America's rarest stamp' as major auction firms and top dealers had widely but incorrectly promoted for decades. Jay made a compelling case for the authenticity of the Winfield Scott ribbed paper classic. The romance and excitement of Jay's Lost Continental high-stakes, bold expose earned comprehensive news coverage and full-page editorial support in the three most influential stamp publications. After 31 years of ridicule by so-called ‘experts’ with obvious ulterior motives -- in just eight weeks from start to finish, in the first-ever one-lot dedicated internet auction (12/21/1999), Jay sold the #164 treasure for $397,838 -- still the internet world record for any single stamp. News of the historic event rocked the stamp world. It is by far the rarest, most valuable philatelic showpiece exclusively marketed on the internet, earning banner news stories in the philatelic press and in daily newspapers. Jay was interviewed on three TV news programs. In January 2000, amid armed guards, the only known example 24¢ Winfield Scott ribbed paper Lost Continental was the top exhibit at San Diego’s 28th annual SANDICAL Stamp Expo setting the all-time attendance record. 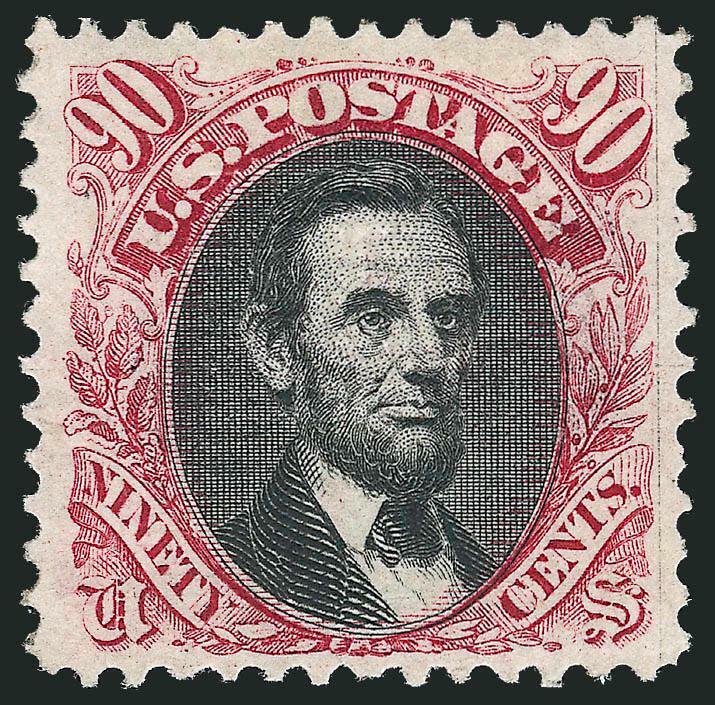 Scott #164 is now recognized by the renowned Scott Stamp Catalogue (established in 1868) as the only unique United States full-number postage stamp. It is certified as the only authentic #164 Continental Bank Note Company 24¢ stamp in the world by the prestigious Philatelic Foundation in New York (established in 1945) -- the 'Supreme Court' of philatelic expertise. And #164 is proudly celebrated in the Court of Honor as America's Rarest Stamp by the American Philatelic Society (established in 1886), the world's oldest, largest and most respected stamp organization. No museum has #164, not even the Smithsonian National Postal Museum. No one can complete a U.S. stamp collection without the Lost Continental. Even the $8 million Zoellner, once the most valuable U.S. collection, did not have this key stamp, which now resides in the fabulous Bill Gross holdings valued at more than $50 million. His award-winning 19th century U.S. stamp collection could not be complete without its capstone flagship, the unique #164, the only one in the world. Jay’s acquisition of the Lost Continental and his landmark auction sale of #164 for nearly $400,000 also established the first shot out of the box world record, an unprecedented initial sale never equaled before or since. Plus, #164 holds the world record for the highest price for any single stamp or philatelic item ever exclusively sold on the internet. The 'singular sweet splendor' Lost Continental today is estimated at $3 million. Becoming the first dealer in history to buy and sell America's Rarest Stamp is the crowning achievement of Jay’s exciting career begun as a collector since the age of five, and as a dealer since the age of 14 in his New Jersey attic. In 1962, an 18-year-old Jay was the first stamp and coin editor of the Las Vegas Sun creating a Sunday magazine editorial and advertising spread. The world’s largest stamp newspaper, Linn's Stamp News (established in 1928), reprinted some of Jay's articles. Jay attended Nevada Southern University (later UNLV) serving as editor-in-chief of the newspaper. He worked nights in 1962-63 as a busboy and waiter at the legendary Sands Hotel, epicenter of the entertainment world during the luminous 'Rat Pack' era, Frank Sinatra, Dean Martin, Sammy Davis Jr, Joey Bishop, Peter Lawford, Don Rickles, etc. Jay co-managed his first political campaign at 18, in 1962, before he could vote, and the stunning victory of unknown Ted Marshall for Clark County DA remains one of the biggest upsets in Nevada history. A decade later, in 1971, Jay’s newspaper, the Las Vegas Free Press, risked everything with an explosive expose preventing a 'cinch’ win by the huge favorite in the Las Vegas City Commission race, Paul Price, the powerful but corrupt top columnist for the Las Vegas Sun. After his shocking defeat, Price sued Jay for $500,000 for 'libel' but the charges were proved and the case was settled totally in Jay's favor. Jay joined the American Philatelic Society (established in 1886) in 1963 (Jay is a Life Member) -- and Jay joined the American Numismatic Association (established in 1891) in 1964 (Jay is an Emeritus Member) -- one of only a few members honored by each of these elite organizations with both the APS and ANA 50th Anniversary Medals. In 1964, at age 19, Jay opened his first stamp and coin office, in downtown Los Angeles (in the Stack Building), soon opening his first retail store, on Spring Street in the financial district -- first of his five Los Angeles retail stamp and coin stores spanning four decades -- the 1960s to the 1990s. is part of the nine-stamp set (1¢ to $2.00) commemorating the 1898 Trans-Mississippi Exposition in Omaha. In 1965, at 21, Jay became the first stamp and coin editor of the Los Angeles Times, creating 'Stamp & Coin Corner' a popular Sunday column that ran for 30 years. In 1965, he leased the Lesser Building penthouse on Wilshire Blvd in Beverly Hills, installing the first nationwide coin teletype system, serving clients from all walks of life including film and TV producers, directors and actors. In 1965-1969, his Fairfax store (adjacent to LA's original Farmers Market) pioneered and helped create the modern stamp, coin, collectible and bullion business. His next three retail stores were in LA's San Fernando Valley -- in Sherman Oaks 1973-1974 -- Studio City 1974-1983 -- and Tarzana 1984-1992, his largest, an upscale 2,000 sq ft retail showroom and auction gallery featuring an impressive holding of rare stamps and coins, classics, errors, inverted centers, historical and presidential documents, rare autographs, paper money, mail and floor auctions, antiques, jewelry, early books, gold and silver. United States Stamp Society, USSS since 1983; etc. Jay served on the Board of Directors of Sandical Stamp Expo, since 1972 San Diego’s oldest/largest stamp exposition. Jay is a former newspaper editor and publisher. In 1970, the infamous Howard Hughes proxy trial was an epic battle for control of an empire. Upon request by Hughes' dynamic lawyer, Chester C. Davis, Federal Judge Roger D. Foley admitted Jay's newspaper as evidence, saying from the bench, 'The Las Vegas Free Press may be the only paper in the nation to get the story straight.' Among many other important stories, Jay exposed Las Vegas Sun publisher Hank Greenspun and Hughes-Nevada CEO Robert Maheu who fleeced billionaire Hughes -- then perhaps the world's richest mogul -- of more than $20 million dollars ($110 million+ in today's dollars). In the 1960s and 1970s, Jay's fearless investigative reporting championed civil and human rights, protecting the environment, a drug-free non-smoking healthy lifestyle and natural foods. He backed stronger federal and state health care coverage, equal opportunity and protection for all Americans. Often for the underdog, he supported minimum wage increases, equal pay for equal work for women, the first Fair Housing Law, and the new Public Defender's Office so each accused person gets a Constitutionally-required attorney -- principles which were then controversial but are now more widely accepted. Jay opposed the Vietnam war but supported our valiant troops and mourned his fiancee's brother and the 58,220 brave U.S. military who tragically died there. In the 1970s, Jay owned Nevada's very first health restaurant, Food for Thought. Bobby Darin was Jay’s close friend and business partner, and his 1973 death at only 37 is still an irreplaceable loss. Bobby wrote and recorded 'Splish Splash' and 'Dream Lover', and sang 'Beyond the Sea', 'If I Were A Carpenter' and the mega-hit 'Mack the Knife' winning two Grammy awards. Bobby recorded 300+ songs, 30 albums, and outdrew Frank Sinatra at the Copacabana and top nightclubs. He co-starred in 13 films, nominated for an Oscar, and won a Golden Globe. In 1970, with life-threatening health issues and rethinking the meaning of fame and fortune, Bobby's career was quiet. Jay truly believed in Bobby's amazing talents and negotiated (gratis, as a friend) Bobby's top salary, $40,000 a week, at Las Vegas Strip Hotels. A month of main room sold-out performances at the Landmark was followed by two engagements of one month each at the famed Desert Inn resort. Bobby's career took off (again) and in his last year with us, before his 'final curtain,' he starred in a weekly NBC-TV one-hour prime-time variety show. Since childhood, Bobby suffered from heart-damaging rheumatic fever and knew, since the tender age of eight, he would not live a long life -- but boy, did he live a full one! Jay's late father, Jack Tell, was a St. John's University Law School graduate who joined The New York Times rising to an assistant editor, the first person in America to see and realize the historical importance of brutal dictator Mussolini's WW2 upside-down death photo. A relative was stamp editor of the New York Post, so Jay grew up within both the journalism and philatelic communities. Jay attended the University of Nevada, Reno and Las Vegas. In 1960, Jay's parents, Jack and Bea Tell, purchased Mark Twain's world-famous Virginia City Territorial Enterprise newspaper from history-railroad author Lucius Beebe and moved the family West. At 17, Jay cut his journalistic teeth writing, researching, editing, setting headlines with ornate hand-carved wood fonts. (For a headline about a fire at the Virginia City Opera House, Jay selected woodblock fonts with hand-carved flames on each letter.) Jay helped run the same century-old Mealy flat-bed press actually used by Mark Twain and an historic Linotype melting lead ‘pigs’ for 'hot type' galley proofs. In 1965, the Tell family founded the Las Vegas Israelite -- 'Nevada's only English-Jewish newspaper' -- well-respected, still going strong, in its 53rd year of continuous publication, still family-owned, with Jay's brother, Michael Tell, at the helm. In 1958, Jay's first major ‘find’ was an 8¢ Liberty plate number block with only one five-digit plate number instead of two (normally, there is one plate number for each color, blue and carmine). It was rejected as a ‘fake’ by major, longtime New York stamp dealers. The owner disagreed since he’d purchased it at the post office. Veteran dealers referred him to an 'error specialist’ across the Hudson River in New Jersey. He was shocked and amused when the ‘Mr.' Tell turned out to be 14 years old with three attic rooms of Lionel trains, planes, toy soldiers, stamps and coins. The man’s asking price was only $3.75 which included 50¢ for his round trip bus fare. After inspection, Jay purchased the widely scorned item and was thrilled to get a certificate of authenticity from the renowned Philatelic Foundation in New York. He soon sold the error for $250 -- a fortune for a ninth grader in 1958 and a life-changing confidence builder. It was the first of only five 8¢ Liberty (Scott #1041) one-number errors ever discovered, and Jay has handled three (ask for the exciting Tell Tales full story, gratis, via email). At 14 years old, Jay's first major 'find' with only one plate number instead of two. Of five of these rarities known to exist, Jay has handled three, including the first. In 1959, at 15, Jay published a 16-page illustrated price list, the first solely devoted to stamp errors, now a classic in the field. Jay has announced major finds of rarities and errors not in catalogs. In 1961, Nassau Street dealer Morris Greebel consigned a 1918 Jenny Inverted Center (#C3a) to Jay who sold it for $4,500, turning a tidy $500 profit for the 17-year-old. Today, Jenny Inverts, the most famous stamp errors, have sold for $126,500 to $1.31 million (depending on condition). From the only sheet of 100 discovered by William Robey in 1918, 97 are known, three are missing (request the full Tell Tales). The unique 1918 Jenny Invert Plate # Block of Four, 'the stuff of dreams,' sold in 1953 for $18,250,1989 for $1.1 million, 2005 for $2.97 million, and in 2014 for nearly $5 million -- an increase of 26,575%. Along with other fabulous U.S. and worldwide philatelic treasures, each a miniature work of art, a large poster of the iconic Jenny Invert Plate # Block of Four with its colorful history is displayed at Smithsonian National Postal Museum's new 12,000 sq ft William H. Gross Gallery. The unique 1918 Jenny INVERTED CENTER Plate # Block of Four sold for nearly $5 million in 2014. In 1966, at 22, Jay listed silver dollars on the NY Mercantile Exchange later selling his seat for a profit. Bank depository receipts for 'Morgan' and 'Peace' U.S. silver dollars (1878/1935) in 1,000-coin bags became America’s newest trading commodity. The landmark event earned a spread in Fortune Magazine. Jay was interviewed on TV and radio programs, including nationwide Joe Pyne Show broadcast on hundreds of stations coast to coast. Jay urged the public and his clients to collect and invest in rare stamps and coins with a finite supply and strong demand -- which have since greatly appreciated. In 1967, at 23, Jay purchased the famous Whitney-Green coin and stamp collection for $350,000 ($2.8 million in today's dollars), a celebrated acquisition, banner national news. His weekly spreads (often in color) in Coin World, the world’s largest numismatic newspaper, brought thousands of store, auction, mail order buyers and sellers. Jay has been an innovator and advertiser since 1958. In the 1960s, in his early 20s, Jay's LA stamp and coin firm with 26 employees grossed millions. In 1983, Jay ran the biggest advertisement in philatelic history, ten pages in Linn's Stamp News (est 1928), world's largest and most influential philatelic publication. This record-breaking stamp mail auction, first-ever to top $1 million, celebrated Jay's 25th career anniversary -- 1,639 lots of 19th-20th century classics, rarities, errors and showpieces. In this lavishly photographed sale were four world-famous inverted centers: 1869 Pictorial Issue 15¢ and 24¢ inverts, 1901 Pan-American Exposition 1¢ invert, 1959 Canada Seaway 5¢ invert -- each a coveted treasure never sold together in the West. in 2008. The finest known unused example (three known to exist) fetched $920,000 in 2013.
known example sold in 2008 for an amazing $718,000 -- more than ten times its $70,000 Scott Catalogue value. Jay's 1992 Elvis Presley driver's license promotion earned priceless TV, radio, print publicity including an entire Liz Smith New York Post column internationally syndicated. Jay has written hundreds of news, feature stories on current events, history, philately, natural foods, the environment, Bill of Rights, truth stranger than fiction, book and stage show reviews. Jay has been the author of popular Tell Tales columns featured in America’s oldest stamp weekly, Mekeel’s and Stamps Magazine, established in 1891; archived in philatelic libraries around the world (Tell Tales columns, gratis, via email). Roosevelt Albums were created in 1903 by visionary and progressive President Teddy Roosevelt, a lifelong stamp collector, recipient of the Nobel Peace Prize, builder of the Panama Canal, author of 47 books ('Rough Riders'), and father of the environmental movement to protect enormous forests, wetlands and national parks for our posterity. He was the trust-buster extraordinaire who broke up railroad, oil and other monopolies lowering prices for ordinary citizens. TR expanded the U.S. Navy (the 'Great White Fleet' toured the world) making America a world power ('Speak softly and carry a big stick'). Teddy Roosevelt's Bully Pulpit pioneered government's new role ('The Square Deal') ending child labor, creating standards for safe food and drugs, workers' compensation, truthful product labeling, ensuring workplace safety. TR inspired Franklin D. Roosevelt's grand reforms we take for granted today -- Social Security, eight-hour day, 40-hour week, massive infra-structure building, CCC, NRA, WPA, TVA, FHA, FDIC, SEC, FTC, FDA; United Nations, LBJ's Consumer Product Safety Commission, health care as a basic human right, the Environmental Protection Agency -- and so much more since 1933. One of the 302 small die proofs, 1847-1903 complete, on gray card backing cut from a 1903 Roosevelt Album page. museums. Jay may be the only dealer to have bought and sold three intact Roosevelt Albums. One is believed to be unique - the only known Roosevelt Album with six extra unlisted proofs. In 1986, Jay purchased a mint sheet (100) of the 50¢ 'Iron Betty’ Lamp -- 44 stamps with the black color 100% omitted. The seller, who'd purchased the sheet in 1979 at the post office for $50, had offers from four dealers. Jay paid his asking price and later sold this exciting new find to America’s legendary stamp dealer Robert A. Siegel, the world's top stamp auctioneer, for $20,000, yielding a sizable return. They reminisced about a teenage Jay's visits decades earlier to Mr. Siegel's mid-town Manhattan office searching for errors, and Mr. Siegel offered Jay a 50-50 partnership on a handshake. The stunning error sheet was then consigned back to Jay to break up and widely promote, with the partners later splitting a hefty additional profit. Today, the discovery is listed as a major error in the Scott Stamp Catalogue. The 'Iron Betty' Lamp was used in Plymouth Colony (perhaps at the first Thanksgiving?) and for the next three centuries burning animal fat, fish or vegetable oil, and quite cleverly designed to save the oil drippings for re-use. Jay is a former consultant-contributor to the prestigious Scott Stamp Catalogue, since 1868 premier annual philatelic reference essential for millions of collectors, dealers, investors around the world; indispensable standard of the industry. Jay has handled world-class stamp and coin rarities, top errors, proofs, essays, covers, 19th - 20th century classics, unique treasures, one-of-a-kind showpieces. Jay has bought and sold 300+ inverted centers, probably more than any dealer except leading auction houses. Most collectors and dealers have never owned even one invert in their lifetime. John Trumbull's huge 1819 painting shows 42 of the 56 signers of the Declaration of Independence. We forgive the talented micro-engraver of the 24¢ 1869 Pictorial Issue, for depicting 'only' 23 Founders in the stamp's tiny vignette. Since 1958, Jay has bought and sold rare autographs, letters, signed photos, historical documents, manuscripts -- such as large, ribbon-bound Presidential Patents (1825,1833,1856) signed by Presidents John Quincy Adams, Andrew Jackson, James Buchanan; and Henry Clay, famed Speaker of the House. Jay has bought and sold a signed Albert Einstein hand- written letter and signed photos of Einstein, JFK, FDR and other historic figures; a Ty Cobb handwritten letter and a 1957 N.Y. Yankee team baseball with 23 ink signatures -- Mickey Mantle, Yogi Berra, Whitey Ford, Don Larson (only World Series Perfect Game), Enos Slaughter, Billy Martin, Bill Skowron, Hank Bauer, Bobby Shantz, Tony Kubek, Carey, Terry. In 1992, a four-page 1834 letter by Gov. Jose Figueroa was rejected by leading autograph dealers and auction houses. With his lifelong love of history and insatiable curiosity, Jay had the letter translated and his original research revealed the document's world-class importance, substantiating a surmised but never-before proven plot against Mexico to return California to Spain. This event -- described in the University of California Berkeley Bancroft Library (2.8 million volumes) world-renowned History of California master work -- was, with this document, finally verified. After a promotion, Jay sold the historic letter for a then-record $20,000. Today, value is six figures; Jay is always thrilled when clients make money. Jay is a polished stamp and coin expert witness, consultant, and incorruptible strategist -- available for mediation, advice, arbitration, depositions, and courtroom testimony. His entire 60-year career is a wealth of front line experience in marketing, negotiating, advertising, auctions, appraisals, purchasing, five retail stores, public relations, promotions, mail order, direct mail, and former weekly newspaper editor, publisher, investigative reporter, columnist; and as a lifelong writer. Jay's most exciting moment as an expert witness: In a San Diego wildfire stamp collection evaluation, bitter litigation was frozen for four long years. On the case two weeks, Jay destroyed key arguments of the opposing expert witness, a PhD Chief Curator of Manuscripts of a world-renowned California museum. Right after Jay's powerful presentation, attorneys for the defendant -- a $10 billion utility -- shockingly and unexpectedly raised their long-time ‘immovable’ offer $1.25 million. Just 30 minutes after Jay's comprehensive report and opinion -- the four-year old totally stalemated and contentious case was suddenly settled for $4.25 million dollars -- thus giving a nice family, who had been totally wiped out, a fresh start. Amid hugs and tears of joy from his clients, it was Jay's most gratifying experience as a long-time expert witness. Jay is devoted to his close-knit family and enjoys time with three daughters, their soul mates, and 'delicious' grandchildren. He lives and works in accord with the examples of high ethics and values his parents set for him when he was a boy. With passion for the joy of lifelong learning, Jay says: "History is incandescent -- it illuminates understanding -- lights the way -- brightens the soul." steel-engraved set of 11; very first American commemorative stamps. Emphasis is always on buying. "You make a profit when you buy, collect it when you sell." Jay purchases stamps, coins, currency, historical and presidential documents, rare autographs, old books, photos, movie, sports, music memorabilia, and other collectibles -- from the sensational to the sublime -- rarities to accumulations -- one hoard was 33 cartons. The stamp and coin business can thrive during any economy, recession or inflation. Liquidity equals strong buying power, assuring profits whether prices go up or down. A stream of people needs to sell for immediate cash. An Appraisal is for insurance or other purposes at estimated retail or market value. An Evaluation is a buying price -- for actual purchase. Jay is an APS Life Member, a member of the American Philatelic Society (established in 1886) since 1963. In 2013, Jay was recipient of the APS 50th Anniversary Medal. In 2014, Jay was also the recipient of the ANA 50th Anniversary Medal from the American Numismatic Association (established in 1891), awarded the ANA Emeritus Member status for life -- one of very few to have received 50-year member medals from both esteemed organizations -- the APS and the ANA. Buying is key to all profits. When you buy anything 'right' there is virtually no risk. If funds must be replaced quickly to prepare for the next deal, the purchase may be sold immediately for a modest profit. If 'flush,' however, and if time is not of the essence, profits may be increased through retail or internet sales, floor and online auctions, trade shows, mail order. With live online auction bidding (PC, lap top, smart phone, iPad, tablet), folks hear live calling of auction lots from homes and offices anywhere in the world, during the actual auctions, and can bid with a click. An avalanche of new dollars has poured into markets by old and new collectors, investors -- thus, the future of the exciting auction business is unlimited. Auction houses get paid handsomely from both consignor (seller) fees and buyer premiums. Sotheby's and Christie's once auctioned $250 million each year. Today, with an flood of internet participants, they each gross many billions annually. A third auction firm, unknown 40 years ago, today sells $1 billion with a reported 600 employees and 24 collectibles divisions. Future inflation is guaranteed, in Jay's opinion, as trillions of new dollars have been printed or electronically created to prop up the economy since the 2008 crash. To protect against ravages of coming inflation, shrewd collectors and investors are quietly buying certified authentic rare stamps and coins which have performed much better than gold and silver. Forbes recently listed an amazing 1,826 billionaires in the world (up 200+ in one year), as contrasted to only 14 billionaires in 1985. Forbes reported 360,000 U.S. $1 million+ annual earners, many more worldwide. Yet, not a single original 19th or 20th century rare stamp or coin will ever be produced again. This combination, a world awash with money and fierce auction competition for a finite or diminishing supply of certified authentic rare stamps and coins, will cause future price rises. Following huge Reagan, Bush and Trump tax cuts for wealthiest Americans (the only times in history tax rates were cut during wartime), more than $40 trillion dollars was transferred from the middle class to the top 10% which now owns 90% of the nation's assets. So-called 'trickle down economics' has never worked -- the rich just get richer. Past performance never guarantees future value -- but dangerous inflationary conditions now exist as never before in all American history. Inflation is changing the world forever. A Manhattan apartment sold for $91 million --17 New York condos fetched $40 to $65 million dollars each in 2017 alone. A Picasso sold for $179 million, nearly triple the $60 million record. A Leonardo da Vinci painting sold for $450 million dollars -- leaving even hardened experts agape. A Bel Air, California estate is listed at a cool $250 million. Two philatelic plums sold for $4.85 and $9.5 million each -- prices which would have seemed obscene or insane a few years ago, until prices go even higher -- with no end in sight -- with cash-flushed mega-wealthy folks increasing every year, buying everything desirable -- especially now, with the Trump tax cuts giving 82% of the benefits to the top 10%. >>> For collectors and investors -- Jay specializes in Certified authentic rare stamps and coins -- perhaps the best protection against coming inflation -- which will surely erode the value of the dollar. Are you protected from inflation? Jay is a veteran buyer, appraiser, expert witness, trusted consultant, agent, marketing pro, skilled deal-maker. With lifelong expertise and top credentials he advises buyers on acquisitions for their legacy collections. Jay is proud and thrilled as rare stamps, coins and other collectibles he has sold to many of his clients have risen greatly in value over the years. Content copyright . AMERICANASTAMPCOIN.COM. All rights reserved.